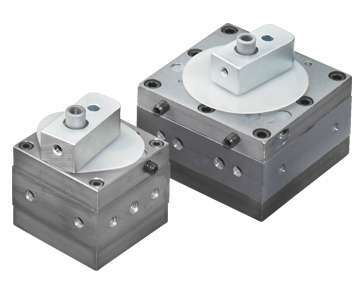 The AGR Pneumatic Rotary Actuators, Models RA-1A and RA-2A, are compact, air-operated devices for producing limited angular motion. They are used for driving high-speed rotary escapements, gating devices, latch mechanisms, etc. The RA-1A can be set for any angle up to 50° and the RA-2A can be adjusted from 45° to 220° by means of adjusting screws. Nylon plugs are provided in the body to lock the adjusting screws. The maximum rated operating pressure is 100 psi. The RA-1A and RA-2A are provided with tapped mounting holes on all four sides and can therefore be mounted in any desired position. They are equipped with glide bearings and require no maintenance other than conventional air line lubrication.